Makes it easier to find a signal and scan for available channels. Less directional than traditional RV antennas. Up to 70% smaller than traditional RV antennas and offers less wind resistance. Better reception of UHF signals where over 80% of new DTV channels are broadcast. Also provides great reception of remaining VHF channels. Install in just minutes without any special tools. 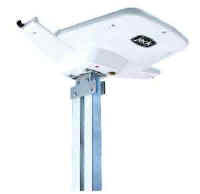 RV bracket allows antenna to be mounted in either direction to clear A/C, vent or other potential roof obstructions. Enhance weak signals for improved reception capability. Includes AC to DC power supply. Also works with existing wall mount or video switch antenna power supply for simple retrofit. Get multi-directional OTA coverage by combining the off-air signals for the JACK antenna with the RV roof mount King-Dome AIR antenna.